"Uneven pitches, bad drainage and huge puddles all over the place." 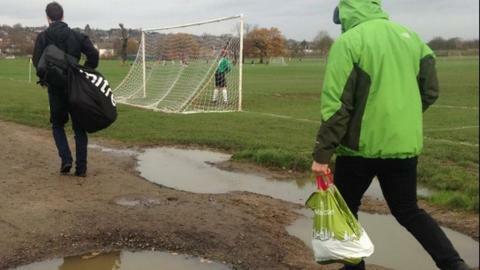 Dog poo in the centre circle, rutted surfaces that can snap an ankle and wobbly goalposts; just a few issues facing amateur footballers in England. The Football Association accepts it is facing a "chronic" problem and a major job addressing the growing shortage of quality pitches across the country. The biggest grassroots survey ever conducted by the FA revealed that the quality of pitches is the biggest factor in how often people in England play football. Its solution is Parklife, a series of hubs that will house and maintain a mix of turf, artificial and five-a-side pitches for public use. Work is yet to start on the first of those in Sheffield next year, and BBC Sport spoke to Parklife FC, a London Sunday league team that decided enough was enough. A bunch of school mates from south-east London decided to form a team in 2002. They are in their 10th season of league football. Their first home was one of the many pitches on Wandsworth Common. Three moves on, they are based on the manicured lawns of the prestigious Alleyn's School in leafy Dulwich. They have an A and B side, a mix of students and professionals, from their late teens to their early 30s. "The main motivator was that we were worried about people getting injured," says Dave Chabbi, player-manager of the club's B team. "We have had a couple of career-ending injuries due to playing on uneven, non-maintained pitches on public commons." "We'd been looking for somewhere for a good couple of years," added Liam Sollis, player and club chairman. "We spent a lot of time toiling away on the commons and public parks." "Uneven pitches, bad drainage, huge puddles all over the place," says Sollis. "When the weather got bad, it wasn't uncommon for us to have an enforced winter break of two and a half months." "The pitches can be very boggy, very up and down, sometimes on the side of a hill," adds Chabbi. "Games were more about territory than possession." "Away teams call it Wembley because the pitch is so good," says Chabbi. "There is a clubhouse with a bar, changing rooms, a pool table and TV. I would never want to leave." "You can enjoy your football more," adds Sollis. "Finding a ground that you like and you want to play on is not easy to do. You have to really hunt them down." Chabbi says the fee for a home game at Alleyn's can be anything from £115 to £135, depending which of the three pitches they get to use. There is also the £35 fee for the referee. According to its website, Wandsworth Council charges £76.30 to hire a pitch on Wandsworth Common on a Sunday morning. "It's worth it," says Chabbi. "Playing at Alleyn's has made a massive difference." According to Sollis, players pay weekly subs of £7.50, plus £5 for an hour-long training session on an artificial pitch and £50 at the start of the season to cover administration costs. What are away games like? "We've had a lot of debates in the pub about the worst pitches we've played on," says Sollis. "Certain pitches are worse than others. "It's pretty bad on Tooting Common, Wandsworth Common and Clapham Common." "They are all public spaces, so have all the usual problems," adds Chabbi. "The standard of football definitely drops. "Raynes Park [near Wimbledon] is my least favourite. The pitches are almost always not flat and the games are usually very bad, with ankles being rolled." Will FA hubs make a difference? "While the hubs sound great, I doubt they are going to change the fact that the majority of our away games are played on poorly maintained public parks," says Sollis. "Unless there are resources to support the upkeep of somewhere like Tooting Common, we will still have to play on pitches that drain poorly, are uneven and proven to be dangerous." "It would be great if there was an affordable option for the other teams in our league," says Chabbi. "I personally wouldn't want to lose our current home ground as the surfaces are excellent and the clubhouse, bar, etc, feels like home to us and as a club we are happy to pay the extra for the privilege."